As early as 1825 a two horse stagecoach ran twice a week between Dover and Wakefield. 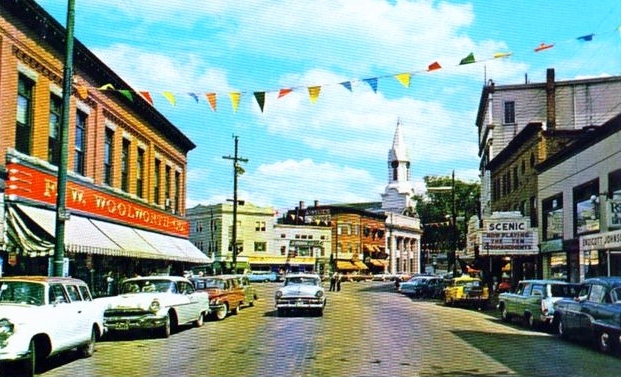 It stopped at Rochester’s Central Square where the current Wakefield, North Main and South Main Streets intersect. A young widow, Mrs. John (Sarah) Odiorne, provided for her family by opening her nearby house to provide food and lodging for travelers. In 1834 her business was purchased by Jonathan T. Dodge who had worked for her for ten years. He also purchased the stagecoach line and ran a stage from Dover to Conway three times a week. The stage, carrying mail and passengers, went to Conway one day and returned to Dover the next. By the late 1840s he was running daily four and six horse stagecoaches between Dover and Ossipee. At their peak his stables had ninety horses. Rochester became a stagecoach center with six horse stagecoaches arriving from Wakefield, Conway, Wolfeboro, Sandwich, Farmington, and Gilmanton and heading to points south and east. Passengers headed in different directions changed stagecoaches in Rochester. Dodge’s tavern and inn served them. His wooden building burned in 1851 and was replaced by the larger brick Dodge Hotel. Although the stagecoaches were being replaced by the railroads, the Dodge Hotel remained busy. Railroad passengers could walk along the newly constructed Hanson’s Street to get to the hotel on the Square. The hotel which could accommodate around 70 people was well known for its cleanliness, excellent beds, and fine food. Jonathan T. Dodge died in 1871 and his widow, Sarah (Hanson) Dodge, with the help of their son, J. Thorne Dodge, continued to run the hotel with the same high standards. She died in 1889 at 80 years of age. Her obituary noted, “Mrs. Dodge was a woman of much executive ability, and a great worker, preferring from choice to superintend the cooking for the hotel. She was an excellent cook and her receipts have been sought by housekeepers far and near. Dodge’s Hotel has always been noted for the homelikeness of its cuisine and for the comfort it afforded travelers.” Her son ran the hotel until he died suddenly in 1901. In 1902 the remaining members of the Dodge family no longer wanted to run a hotel. It was torn down and replaced with a three story brick commercial building known as the Dodge Block. 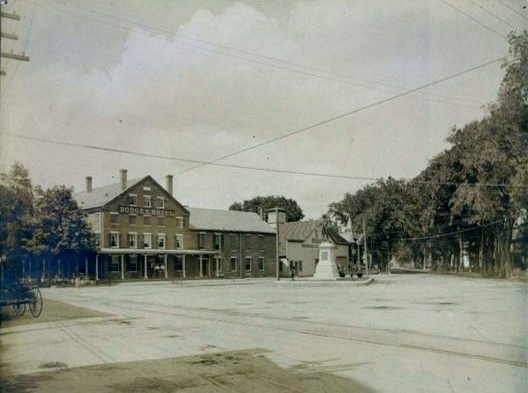 It was soon occupied by a variety of businesses, including banks, dentists, jeweler, drug, clothing, shoe, and hardware stores, law, real estate, and insurance offices, the local telephone exchange office, and the Masonic lodge rooms that filled the third floor. 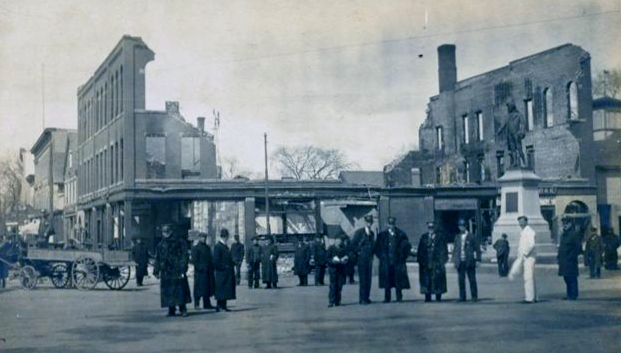 In 1908 the building described in the Rochester Courier as “the most conspicuous, the newest, most modern and valuable of the business blocks of the city” was heavily damaged by fire. Although the firemen worked heroically and were able to prevent the flames from spreading to other buildings, the Dodge Block was left in ruins. It was rebuilt as a two story building. Woolworth’s five and dime store was on the first floor from 1912 until December 31, 1981. 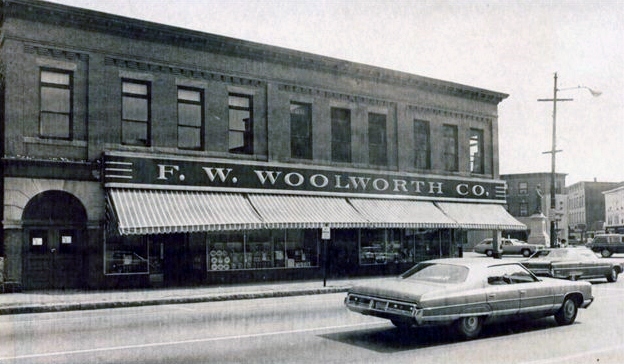 With its wooden floors, lunch counter, and wide variety of goods, Woolworths was a popular shopping destination for generations of area residents. The F W Woolworth chain, for many years one of the world’s largest retail chains, sold discounted general merchandise at fixed prices, originally five and ten cents. The Dodge Block is currently occupied by Citizens Bank.